The climax came at 4:30am. I awoke to lights flashing in the bedroom window blue and red, and an impassioned duet of mid-range D flats pulsing in the night made day by backhoes outside repairing the road. A water line had been recently replaced, and this looked to be the final patch job. I ventured out in my nightcap to find a steamy scene of hot asphalt, groaning machines and foot soldiers deployed to make Harrison Street passable by dawn. The surrounding homes were cast in a garish light. A few stars and a half awake moon offered their everfresh light and timeless telling of time, for anyone interested. We could learn from them. Unlike much-trod earth, they need no repair. The metal slaves, so skillfully maneuvered, performed a bulky ballet, balanced on well-tired treads, beeping their D flats to warn all groggy neighbors that the backhoes were, once again, backing up. Memory returned of the cavity the dentist had recently drilled and filled. Part dentistry, part vascular surgery, asphaltistry is the means by which our aging infrastructure of water lines is made new. There's the tough skin of the road to break, the cavitied old pipes to remove, the new to install, the links to homes to tie in to, and finally the wound to fill with steaming asphalt and scraping blade. An environmentally themed Saturday should ideally begin big, with, for instance, the idea of recycling a house. The house in question, brimming with well preserved 2X4s and long spans of 2X8s, is being taken down piece by piece in my neighborhood, which of course I probably wouldn't have noticed if I wasn't the designated dog walker. I introduced myself and asked if they could set aside the wood so that the Friends of Herrontown Woods could use it for refurbishing the historic Veblen house and cottage. Yes, said the contractor. A small cheer rose from my heart. It will take some followup, though, to make sure the workers don't cut all those beautiful old floor joists and rafter braces up into short lengths. Saturday being the last electronics recycling day of the year, I asked a neighbor if I could take his television along. He had put it out on the curb a couple weeks prior, hoping someone would take it home and use it. I had taken that opportunity to knock on his door, introduce myself as a neighbor, and let him know that it's "illegal" (that's the New Jersey spelling of illegal) to landfill TVs and computers. I doubted anyone would take the TV home to use. More likely, a scavenger would come along, break the back panel and make off with the copper coil--good for a couple dollars at the local scrap yard. By the time electronics recycling day arrived, he had a matching pair of behemoths ready to go, making the pickup truck look like an ark for electronics. As we pushed them up onto the truck with a dolly (no back-breaking heroics, thank you), I noticed he had an old Mustang in his garage. He bought it in 1965, and it still serves as a backup for his bicycle. He said he bicycles more miles in a month than he drives in a year. Now there's something to aspire to. The guys at Princeton's Shrredtemberfest (closer than the county's parallel event) were good sports about unloading. so it was back to Shrrrrrrredtemberrrrrfest so the rejected TVs could join the rest of the old and bloated on a journey to productive deconstruction. With 300 pounds of TVs delivered for recycling, it was time to repair a folding ping pong table. With the quick tempo of life, and factories glutting the marketplace with merchandise, the art of repair has generally fallen into disrepair. Many people give up on an item at the first sign of defect. Though the ping pong table had been abandoned, it was still in good shape, and needed only a couple screws and some tightening up of the metal frame to be functional again. That's another 250 pounds diverted from the landfill, and a $500 item that can now have a new life. Later, I was taking my family to the train station when we started seeing bicyclists funneling into Princeton on Washington Rd, like monarch butterflies making a fall migration. They turned out to be 175 strong, part of the annual Climate Ride from New York to Washington, D.C. Back in colonial times, it took two days to ride a horse the 100 miles between New York and Philadelphia. Princeton was conveniently located midway for a stopover. Remnants of the historic inn may still exist in the Gulick House, out towards Kingston. The Climate Riders (shall we call them the Earth's Angels, with strong hearts instead of leather jackets?) use Princeton the same way, for their first night's stopover. They pitch their tents on the lawn at the YM/WCA, then head to campus for some inspiring lectures. With each speaker receiving cheers, it was one of the more spirited gatherings to talk about climate change, starting with a showing of the short video, The Man Who Lived On His Bike. The leader of the student group Surge made brief remarks, followed by the ride's top fundraiser, who works at the World Bank. She described the projected impact of a 4 degree centigrade rise in temperature this century. "Small number, big problem," was the memorable phrase. She was followed by Deborah Goldberg of EarthJustice, who gave a primer on the many downsides of fracking, lest we think that natural gas is a clean alternative to other fossil fuels. On the way out, one of the cofounders encouraged me to join the ride next year--flattering, though as a veteran puddle jumper I look upon touring bicyclists as somehow inhabiting another plane of reality, beyond anything I could aspire to. Heading home, with Nassau Street alive with people on a mild fall Saturday evening, I heard a roar coming from the stadium area of campus. It was a bigger roar than the 175 climate riders could muster, with the focus not on carrying civilization and nature safely into the next century, but rather carrying a ball across the goal line. Have to say, Princeton's offence is impressive. They kept Lehigh on their heals with varied plays, no huddle, and a quarterback who can both throw and run. Princeton scored easily on the series that I watched before departing as the first raindrops began to fall. It was ultimately a losing effort, 28 to 29, but they showed up, played hard, and their skill and spirit made for a thrilling contest. The articles in the paper will tell of the tough loss, the lessons learned, the need to bounce back. In a day, a week, a season, what mattered so much at that moment when the game was won or lost will be forgotten. Meanwhile, the biggest game of all, the one whose consequences will never be forgotten, is being played every day. It's the fourth quarter, and all the players (that would be all of us, the Climate Tigers?) are still arguing about whether to show up, whether the opponent is really, really real, who will carry the ball, whether victory is even possible. The recyclers made a nice end run around the landfill with all of those TVs. Reusing the wood from the house could be a breakthrough right down the middle, if the contractor agrees to play. The Climate Riders are leading the cheer right down the eastern seaboard. My now, two days later, the Not So Easy Riders are halfway to D.C., riding 50 to 75 miles a day along country roads. Monarchs, also headed south, can do 30 to 50 miles a day, gliding on favorable winds. On one level, it's all a game, in the exhilarating sense that there is a goal, an obstruction, victory and defeat. There's the sport of recycling a house, or a TV, of moving a ball down the field or a bike down the road, or of reaching 2100 with a hospitable planet still in our keeping. It's just that the stakes are radically different. Lose a football game, life goes on. Lose a stable climate, life is forever diminished. And yet the loudest cheers are for what matters least. All that passion being spilled on ephemera, day after day. Yes, let's revel in the thrill of a goal line stand. But don't forget that we're players, too, whether we admit it or not, in the highest stakes game any of us will ever play. I savored the cheers rising from the crowd of Climate Riders, and can only hope they grow. A hundred or so bicyclists ride from New York to Washington, D.C. every year, stopping in Princeton overnight. Just found out that tonight's the night, with some speakers at McCosh 10 from 7-9pm. Here's a past post with photos of their overnight stay at the YMCA. More info below. The last electronics and hazardous waste recycling day before winter is tomorrow, Saturday, September 21. Information at this link. If you have just a few things to take, email me (address is in the "About Me" link, in a pop-out menu on the right of this page), and I may have room in my pickup truck. Here, in the southwest corner of Princeton, out Quaker Road, where Washington led his troops by night towards improbable victory, soybeans grow and the Historical Society of Princeton makes its home at Updike Farm. I like to think of Princeton as being anchored in the southwest by the expansive farms of the StonyBrook valley, and in the northeast by the microfarms of the boulder-strewn Princeton Ridge's Herrontown neighborhood, best exemplified by the Veblen farmstead, where an 1870 farmhouse still stands. Oswald Veblen, math professor and visionary, had a hand in preserving both of these geographic bookends. His acquisition efforts in the 1930s cobbled together 600 acres later preserved as the Institute Woods in the southwest, and 95 acres in the northeast that became Princeton's first nature preserve, Herrontown Woods. The big barn at Updike Farm recently got a new asphalt roof. There is no better gift for a historic structure than a good roof. A particularly thoughtful thing the Historical Society staff did, after acquiring the Updike Farm, was to ask people like me for ideas on what to do there. I suggested planting native wildflowers over the septic field and using the wonderful breeze that blows across the valley to drive a wind generator. A windmill doesn't generate electricity, but this beautifully restored windmill looks ready to supply water. The sign thanks Treby and Steve Williams, and Ann Lee Saunders Brown, for making the restoration possible. The corn and soybeans on the surrounding fields are harvested once a year, but the wind can be harvested yearround. The Sipprelle Unity Garden is well tended to, safe within its deer exclosure. A cinder bike trail extends along Quaker Road out to Updike Farm, though there may still be a gap between it and the paved trail along Mercer in front of the Princeton Battlefield. Plans are to extend the bike trail along Quaker Road all the way to the canal towpath, which will make a fine loop for bicyclists. The Society's events calendar includes open houses at the farm on the third Saturday of each month. On the way out to the farm, another historic fixture in Princeton's southwest corner is the Quaker meeting house, located back through the woods behind the Princeton Battlefield's Clarke House, next to the Princeton Friends School. According to a fine writeup on the history of Quakers in Princeton, "most of what is now Princeton Township came into the possession of six Quaker families: Richard Stockton (the grandfather of the signer of the Declaration of Independence), Benjamin Clarke, William Olden, Joseph Worth, John Horner, and Benjamin FitzRandolph." Clarke, whose farm later hosted the Battle of Princeton (imagine their surprise when guests showed up on that fateful day), donated the land for the meeting house and cemetery in 1709. The kids and day campers at the Friends school have their own meeting space sheltered by towering trees next to the Institute Woods. The trees offer their own kind of living history, exploring the mysterious depths of the good earth while reaching for the sky. In Princeton, with so much history at hand, we can do the same. How photographs travel in space and time, from the beginnings in the early 1800s up to the present, is the subject of a new exhibit at the Princeton University Art Museum. The exhibit begins with a "googlegram"--10,000 images from a google search of the words "photo" and "foto", assembled to evoke the image of the earliest known photograph, from 1826. 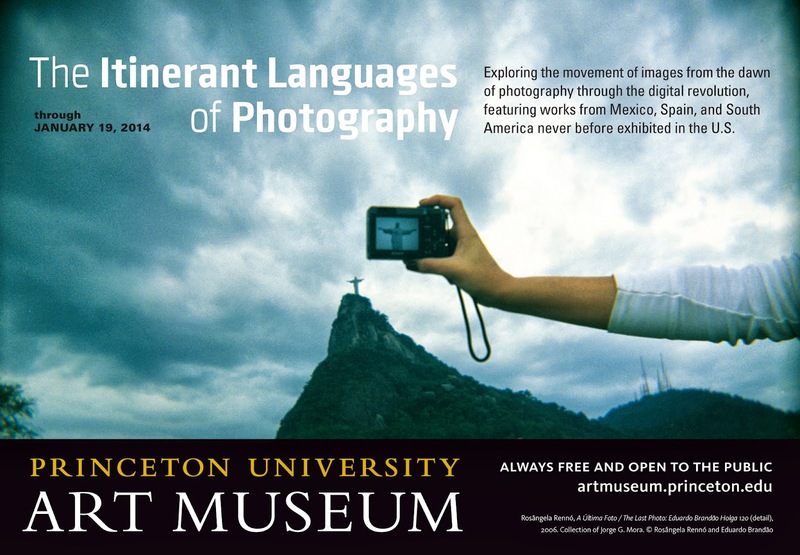 From a writeup by Linda Arntzenius in the Town Topics: "Attending this exhibition brings fresh perspective to the activity of taking and/or making photographs." More info below. This exhibition will examine the movement of photographs, as disembodied images and as physical artifacts, across time and space as well as across the boundaries of media and genres, including visual art, literature, and cinema. It features photographic materials from the National Library and the Instituto Moreira Salles (Rio, Brazil), the private collection Foto Collectania (Barcelona, Spain), the SINAFO (Mexico), and contemporary photographers, some of which have never been exhibited in the States before. 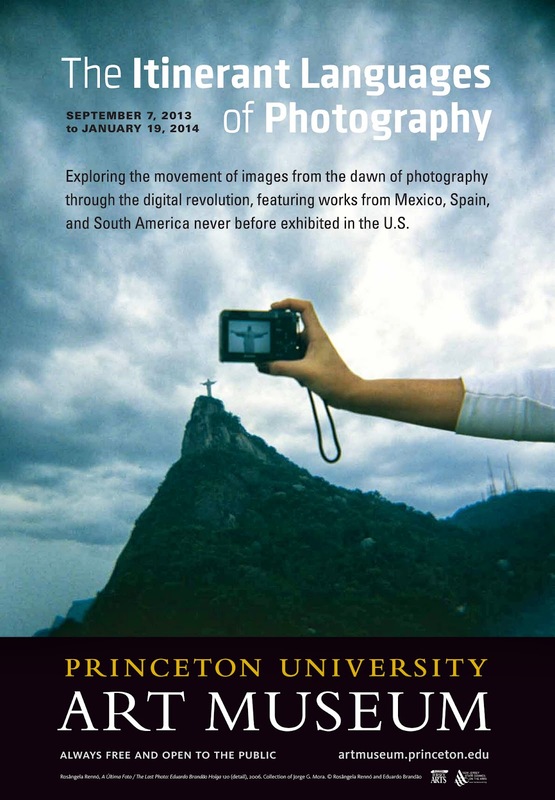 The exhibition is co-curated by professors Gabriela Nouzeilles and Eduardo Cadava.